Windows 8 is able to combine PC computing with Wi-Fi. You can roam seamlessly across networks using 3G and 4G mobile broadband (MB). Setting up this technology is now much slicker than with Windows 7 or Vista. It’s freedom from those RJ-45 cables that makes mobile computing feasible. Windows 8 tablets make the most of a new generation of hardware and software. For example, ‘instant-on’ means a reduction in scanning time so there is only a 1 second delay between coming out of sleep and connecting to the internet. Mobile broadband is now integrated with the OS, that means users don’t have to research mobile operators’ software because Windows Store takes care of that chore. And there is no need to search for the correct device driver because Windows Update already has downloaded the driver. Windows 8 looks-up the mobile broadband information from the SIM, or internet card, and then interrogates the APN (Access Point Name) database for the most suitable mobile phone operator. The operating system then connects to the wireless network without user intervention. This technology is also able to switch automatically from broadband to Wi-Fi should it detect a more suitable connection. It also enables a wireless computer to roam from one access point to another, constantly locking-on to the access point with the best quality. Windows 8 keeps track of your usage and it’s a particularly good use of the Metro-style Tiles to display the information. See 'Estimated usage' in screenshot above right. Although Microsoft's connection manager gives priority to trusted Wi-Fi devices, it will switch to mobile broadband if no trusted Wi-Fi device is available. Just remember that this could mean that your connection is not secure, especially in public places. Airplane Mode – Off or On? 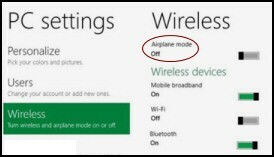 You can see from the screenshot where to find the Windows 8 Airplane mode. Let us check the logic here, Airplane mode 'On' means that your device will not send or receive any data via Wi-Fi. The benefit is that you can still work with programs that don't require the internet. Furthermore, just as with a mobile phone, you can start receiving messages again by flicking the Airplane mode to 'Off'. See more Windows 8 PC settings. Be carefull when using Mobile broadband in public places, while it may be easy enough to connect you may unwittingly rack up a huge bill. My advice is to leave Mobie broadband 'Off' unless there is a particular reason for accessing that particular network. If you see a little triangle with squares in the corners, then you are connecting to another computer by wireless directly. Normally, at least in my experience, the two or three computers would see one another courtesy of a wireless access point, but in the case of the triangle symbol the Windows 8 machines make an direct ad-hoc connection. Resist the temptation to disable IPv6. I seriously doubt it will solve the problem, and could actually create connection difficulties with other Windows 8 features. The mobile network configuration in Windows 8 will be as easy as it is on modern smart phones. It will move automatically between the 3G or 4G phone networks and the Wi-Fi networks used in homes, in the same seamless way as a smart phone.